I have a gripe with the world one of many I know LOL but this is with a little something called social media marketing! Social media has become a platform that is easily accessible to anyone with internet access. Increased communication for organisations fosters brand awareness and often, improved customer service. Additionally, social media serves as a relatively inexpensive platform for organisations to implement marketing campaigns. With emergence of channels like Twitter, the barrier to entry in social media is greatly reduced. Social media marketing programs usually centre on efforts to create content that attracts attention and encourages readers to share it with their social networks. A corporate message spreads from user to user and resonates because it is coming from a trusted source like a friend or family member as opposed to the brand or company itself. For me Social Media Marketing has become much like the spoof game show NumberWang with people trying to pluck numbers out of thin air just to "win" and the willingness to form supposed friendships with Bankers, pet manicurists and people in real estate (I'm not saying these people are bad in any way, shape or form! by the way!) just that I feel uncomfortable with it. I want to follow the people I like and I wish that people that liked my posts followed me. Social Media Death By NumberWang! I made a foray into social media marketing long ago and I'm becoming increasingly disenchanted with it and having my news feeds clogged with nothing more than spam by people with constant links to themselves, Now I admit to using the likes of Klout and Empire Avenue as a means of giving the radio blog a bigger share of internet traffic as well as getting a wider audience. Empire Avenue is like an online stock market where you trade yourself or business so if people like your business they will invest, but it's annoying how quickly it turns into "invest in me and I'll invest back" because all some people care about is themselves and their stock (I guess it is natural to look after number one) and Klout which is supposed to show you what your network is and what kind of networker you are, Good idea yes? I thought so! but even that has turned into a numbers game so rather than improving my network and networking skills I cannot improve unless I partake in NumberWang. I understand that social media marketing in this manner is a necessary evil as I HAVE TO USE IT!. In my post on Google+ I recognised that our attitudes are changing as we are relying more on what our friends recommend so social media marketing works and I'm not against that especially between friends. We have to do something about social media business spammers! I know you might think I'm whining about it but they are annoying to me and this article is aimed at starting a conversation on the issue! So comments are more than welcome! 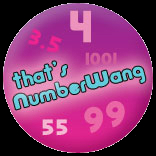 P.s If you don't know what I mean by NumberWang search for it on YouTube then all will become clear!